My Grandfather must have been an enthusiast of Lea Francis cars, because despite the fact that they were never made in great numbers, he owned three of them at one time or another. The oldest was a 1928 van, possibly converted from a car, registration RM 4773. This survived until about 1957 as a delivery vehicle for the family's market gardening business, before being scrapped. The next was a 1929 'V' type, GU 2335, chassis number 17004. This was last taxed in 1936 and was never registered in my Grandfather's name, which leads us to think that it was bought in late 1936 as an accident write-off, to provide spares for the van. Finally, BAO 673 was a 1936 'Ace Of Spades' model, my Dad thinks the 49th? of 50 built although we are not certain of this. This was the family transport until 6 June 1956 when it was part-exchanged for a Mk.7 Jaguar at a dealer called S.M.T. in Dumfries. The Lea Francis allowed �0 to be knocked off the �0 bill. My Dad thought that this car had gone to a collector, but it now seems to have disappeared, so presumably it has been scrapped. Our story therefore concerns the 'V' type - the one which was written off in 1936! 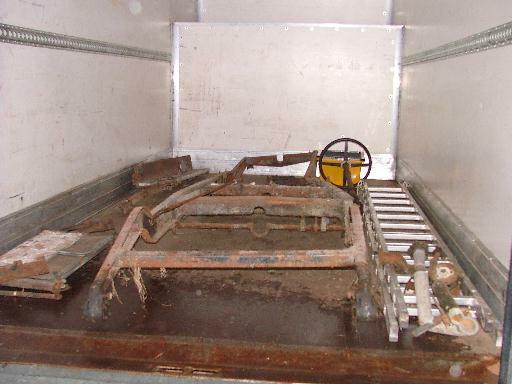 Various parts were removed from this including the engine, running gear and bodywork, leaving just the chassis. 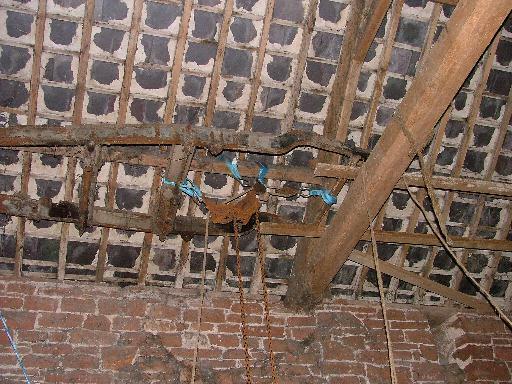 Rather than scrap this, they decided to hoist it up into the rafters of the barn where it could be used to support a block and tackle over the doorway, for loading up farm trailers and so on. 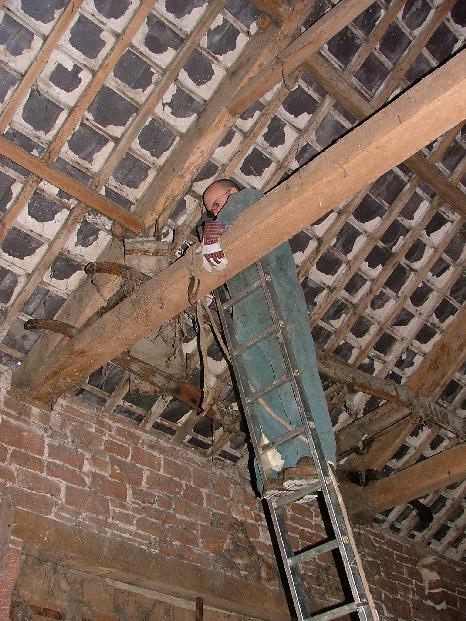 When we came to clear the farm in mid-2005, the chassis was still there above the barn door, some 15 feet up in the air. Our inclination was to leave it there, but just in case it was of particular interest I decided to contact the Lea Francis Owners Club. 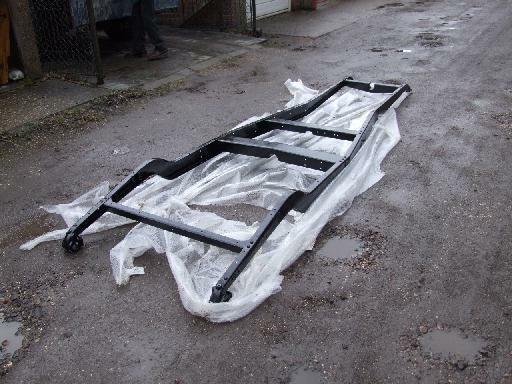 I was quite surprised to get a reply from Colin Poynter, the club's registrar for pre-1937 Lea Francis cars, to say that he had been looking for such a chassis for many years, as he had most of the other components for a similar 'W' type model, but no chassis! So, a deal was struck, and on September 17th Colin and his wife Sarah made the long drive up from the southeast in a hired Luton van, and together with my father and I set about freeing the chassis from its storage site of 68 years! 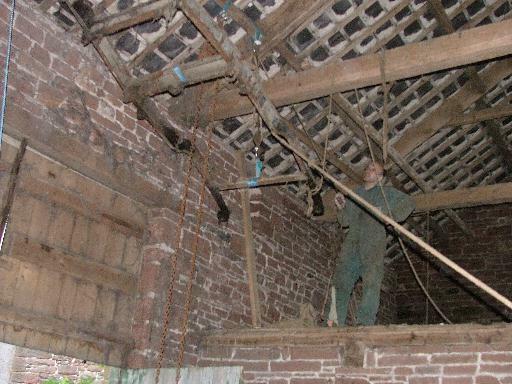 These photographs give a flavour of the work which went into the 'rescue'. The whole exercise took about five hours. 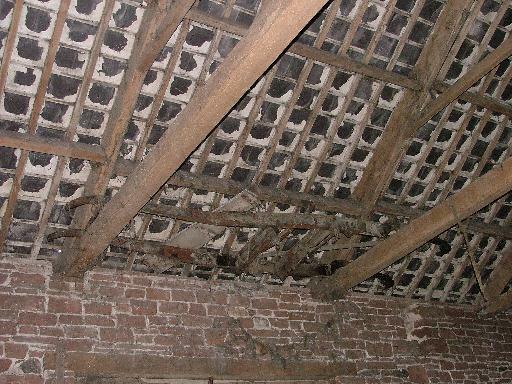 The chassis, 'as found' in the barn roof. Photo © P. Hetherington 17/09/05. 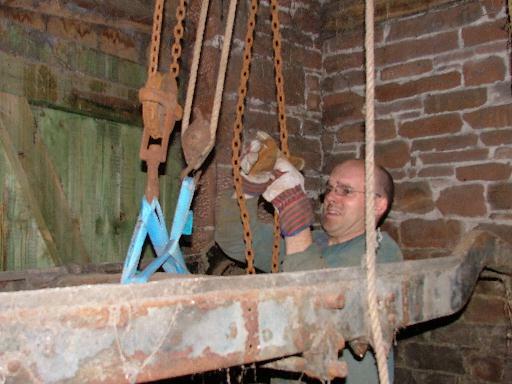 The piece of wooden running board was lowered down first. There was also an original leaf spring sitting atop the chassis. 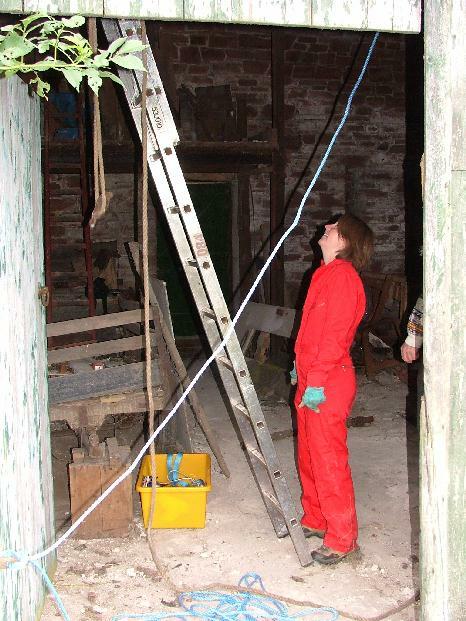 ...While Sarah holds the ladder. 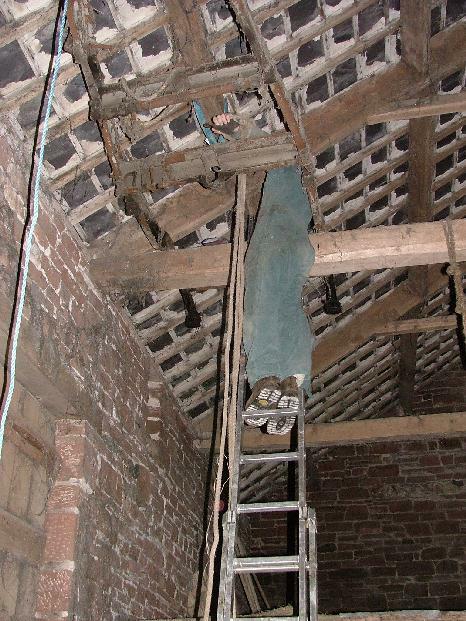 There wasn't enough room between the roof truss and the chassis, leading to this 'interesting' arrangement of pulley plus block and tackle. 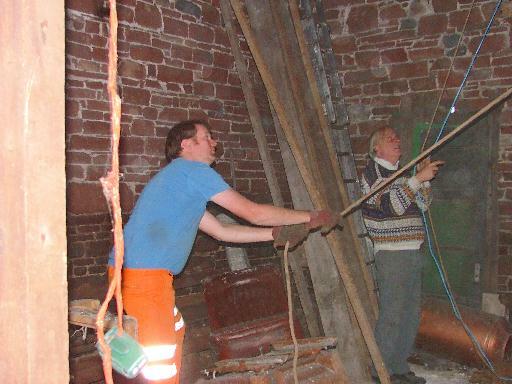 Two pieces of wood were jammed underneath to assist in getting it off the beam. Photo © S. Poynter 17/09/05. It was really pretty well stuck, leading to much head scratching and the addition of more and more ropes and things. 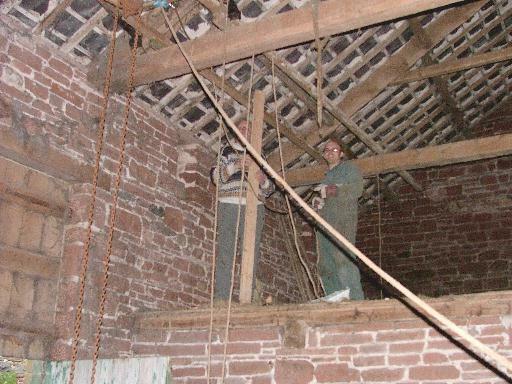 We knew that once it was off the beams there was no going back! 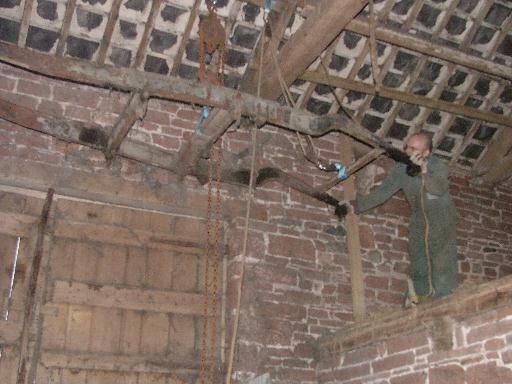 My Dad and Colin are standing on the old hay loft here, from which one end of the chassis could be just about reached. Hmm... now what do we do? 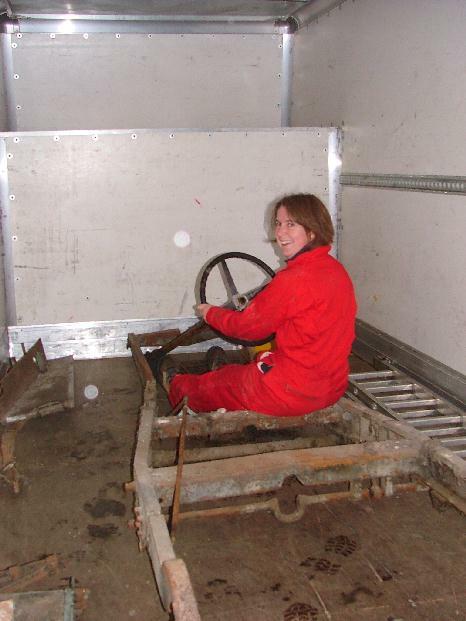 At this stage the chassis was still stuck fast at the other end! ...Then eventually we manage to free the other end, and the chassis is now hovering in mid-air. It was now simply a case of carefully lowering it to the ground. Following which we untied it and loaded it into the van. The 1936 accident damage, at the front of the chassis on the right hand side, is very apparent in this view, but it can be straightened. Finally, Sarah enjoys the comfort of their new car! I would like to thank Colin and Sarah for allowing me to use these pictures. I wish them the very best with their project - it's certainly a brave one! They may well wonder just what they've taken on more than once over the next few years. Remember, what doesn't break you makes you stronger! I look forward to the day when I can add a photograph of a gleaming Lea Francis saloon to this page. Until then... good luck! Early in 2007 Colin sent me this photo of the chassis, completely straightened and restored by a company called Blaker at Dial Post in Sussex. The workmanship is, apparently, superb. There's a long way to go, of course, but it's an excellent start! Return to farm machinery page.